Pastel de Tres Leches – Three-Milk Cake is very popular in Central and South America. 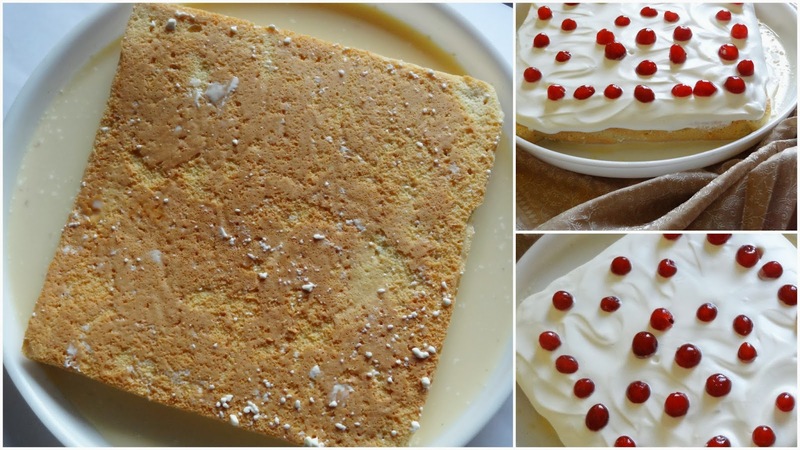 It is a super moist, light, airy and super delicious sponge cake soaked in three kinds of milk (evaporated milk, condensed milk, and heavy cream). Tres Leches is a very light cake (especially if made without butter), with many air bubbles in its crumb. This distinct texture is why it does not have a soggy consistency, despite being soaked in a mixture of three types of milk. This month's daring baker's challenge, hosted by Inma from La Galletika, Sept. 2013 Daring Bakers’ hostess and WOW did she bring something decadent and delicious! Pastel de Tres Leches or Three Milk Cake, creamy yet airy, super moist but not soggy...just plain delish! September is very special month for me as this month is my Husband's birthday. I was searching for something new to try for his birthday which he or I have never tasted before. Hence, when I saw this month's Daring Bakers Challenge, I sort of immediately made my mind on what to make for his birthday...a Tres Leches Cake! I made this cake a day before my husband's birthday and the day was so busy as I baked another cake for a friend who was leaving the town and made some Nutella Cookies for her cute l'il nephew Ayan. All of it, in the middle of the week juggling myself between some office work and some baking at home. While this cake was baking in the oven, it gave me some solace as the house was smelling so fresh and so festive that I really forgot all the crazy stuff going around. This cake was enough to calm my senses down. I poured the three milk syrup over the cake and left the cake in the refrigerator to let it soak the syrup and went to watch the movie; The Lunch Box, a movie with the moving performance by Irrfan Khan (Life of Pie fame). The movie was set in the city I live, Mumbai and depicts the life of people in Mumbai very minutely. When I was back home, it was midnight of September 26 and my husband's birthday. 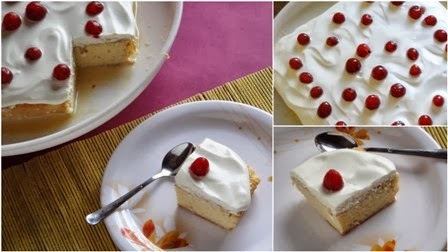 I checked on the cake kept in the refrigerator and saw that the cake had completely absorbed the milk syrup and then I whipped the cream and kept the cake ready for his birthday with some cherries on top. I wasn't sure if I would get good reviews about the cake as it was a special day and I tried something I never made or tasted before, but my hubby was really impressed with the cake. Once again, thanks Inma for sharing the wonderful recipe with all of us!!! Add the two and stir it until well combined. Now, measure and use only the quantity specified in the recipe above. Preheat your oven to 180 degree C/350 degree F. Line a 9x9 inch square baking pan with parchment paper. Separate the egg whites from the yolks when the eggs are cold. Let it sit for 1 hour to come to room temperature before preparing for the cake. Beat the egg whites on medium speed for 3-5 minutes until soft peak comes. When soft peak forms, start adding sugar 1 tbsp at a time while continue to whisk. Whisk the egg whites till it forms stiff peaks, about 5 minutes. Set it aside. In another bowl, beat egg yolks, at medium speed for about 5-6 minutes, until the egg yolks becomes pale in colour, creamy and puffy. Stir in vanilla extract. Add the egg yolks over egg whites and fold it gently using a rubber spatula until well combined. Try not to lose any volume from the mixture. Sift the flour over the egg mixture and fold it very gently just until combined. DO NOT over mix the batter. Pour the batter into the prepared tin. DO NOT knock the cake tin when containing batter. Bake in a pre-heated oven for 25 minutes or until a tooth pick inserted in the center of the cake comes out clean. Once, the cake is baked, let it cool in the cake tin for 5 minutes and then transfer onto a wire rack. Let the cake cool completely before proceeding on to the next step. Once the cake is cooled, invert the cake to a dish having high edges, see the one shown in the picture above. Using a fork, poke all over the cake (on the sides too) to better absorb the milk syrup evenly across the cake. In a saucepan, add the sweetened condensed milk, evaporated milk, half and half and cinnamon stick and bring it to a boil. Once the milk mixture is boiled, reduce the heat and simmer it for 5 more minutes. Remove it and let it cool completely. Add rum on the cooled milk syrup and pour it all over the cake. Let the milk syrup drop over the sides of the dish. Let the cake rest in the refrigerator over 2 to 6 hours (best if left overnight) and the cake will magically absorb all of the milk syrup from the sides. Whip the cream until soft peaks, add the sugar 1 tbsp at a time and whip it as best as you can. My cream did not whip to the stiff peaks as it contained lower fat %. For better results, you can whip the cream by placing the cream bowl over a bowl containing ice. Layer the whipped cream on top of the cake and decorate it with fresh/ canned fruits of your choice.